Objective: To summarise the evidence on the effect of psychological coping styles (including fighting spirit, helplessness/hopelessness, denial, and avoidance) on survival and recurrence in patients with cancer. Design: Systematic review of published and unpublished prospective observational studies. Main outcome measures: Survival from or recurrence of cancer. Results: 26 studies investigated the association between psychological coping styles and survival from cancer, and 11 studies investigated recurrence. Most of the studies that investigated fighting spirit (10 studies) or helplessness/hopelessness (12 studies) found no significant associations with survival or recurrence. The evidence that other coping styles play an important part was also weak. Positive findings tended to be confined to small or methodologically flawed studies; lack of adjustment for potential confounding variables was common. Positive conclusions seemed to be more commonly reported by smaller studies, indicating potential publication bias. Conclusion: There is little consistent evidence that psychological coping styles play an important part in survival from or recurrence of cancer. People with cancer should not feel pressured into adopting particular coping styles to improve survival or reduce the risk of recurrence. We carried out a comprehensive systematic review to assess the strength of the evidence for an association between psychological coping and cancer outcome. Search strategy—Following systematic review guidelines 11 12 we searched several databases for published and unpublished studies (in any language) on the association between progression of cancer, recurrence or survival, and psychological coping: Medline 1966-June 2002, PsycINFO 1887-June 2002, ASSIA 1987-June 2002, Embase 1980-June 2002, Cancerlit 1966-June 2002, Dissertation Abstracts 1975-June 2002, the NLM gateway (accessed 21 June 2002), and CINAHL 1982-June 2002. We searched bibliographies and reviews and contacted key individuals and authors for additional unpublished information when necessary. Inclusion and exclusion criteria—We included prospective cohort studies that included mortality, survival, or recurrence as outcomes. We excluded studies of the association between coping and immune responses or other biochemical markers, if this was the only outcome reported, and studies of personality types (for example, “type C” personality). Data extraction and validity assessment—When the results of both multivariate analyses and univariate analyses were presented we extracted data from the multivariate analysis and noted the variables used in the adjustment (table 1 and 2). When necessary we contacted authors for unpublished data; one author supplied the requested information. Data were extracted by one reviewer and checked by a second. The studies were assessed independently by two reviewers against three methodological criteria: whether the sample represented an inception cohort, the degree of adjustment for potential confounders, and whether the assessment of coping was carried out early in the disease process. The results were summarised narratively. We found 26 studies that investigated the association between psychological coping and survival and 11 studies that investigated recurrence (figure). Some studies were reported in more than one paper—for example, results pertaining to different follow up periods. The most common diagnosis of patients in these studies was breast cancer, though we also found studies that investigated leukaemia, melanoma, and lung and gastrointestinal cancers, with follow up periods ranging from several months to 15 years (tables 1, 2, and 3). Anxious coping/anxious preoccupation, depressive coping—Ten studies investigated the impact of an anxious or depressive coping style on survival. 6 7 14–19 34–40 One small study reported that higher anxious preoccupation scores predicted shorter survival,13 and a study of 103 patients found that the use of depressive coping predicted shorter survival. 39 40 Three studies presented relative risks associated with anxious preoccupation, all of which were close to 1.0. 7 13 18 19 One small study (n=35) reported an association between depression and survival, though this study had methodological drawbacks with respect to patient recruitment and confounding.38 None of these psychological factors was reported to be significantly associated with recurrence of cancer. Active or problem focused coping—Eight studies explored the effects of active or problem focused coping on survival, 1 8 27–29 34–37 39–41 one of which (n=103) reported that the use of active coping was a predictor of longer survival up to seven years. 39 40 The largest study (n=847) compared high, medium, and low users of this coping style and found no association with survival after they controlled for clinical and sociodemographic factors.1 Another study (n=133), which investigated a coping style labelled “coping by control,” reported no significant findings.41 Active or problem focused coping was not associated with recurrence. We could not carry out standard methods of assessing publication bias such as funnel plots because there was great heterogeneity among the studies and there were only a small number of studies in each category of coping style. Studies that reported “positive” findings were smaller than those that reported non-significant findings (mean sample size 89 v 198, P=0.02, two tailed), which is indicative of publication bias. It is commonly believed that a person's mental attitude in response to a diagnosis of cancer affects his or her chances of survival, and the psychological coping factors that are most well known in this respect are fighting spirit and helplessness/hopelessness.42 We found little convincing evidence that either of these factors play a clinically important part in survival from or recurrence of cancer; the significant findings that do exist are confined to a few small studies. Good evidence is also lacking to support the view that “acceptance,” “fatalism,” or “denial” have an important influence on outcome. Our review has several possible limitations. Firstly, the validity assessment focused on only three methodological criteria and other criteria are known to be important, such as the adequacy of baseline information.43 However, when we piloted the validity assessment checklist these criteria did not seem to differentiate adequately between the studies. We could have adopted a more stringent set of criteria, but this would be unlikely to alter the (already negative) conclusions of the review. The review may also be subject to publication bias because the studies reporting “positive” findings tended to be smaller. We tried to identify unpublished studies, including theses and conference papers, but small studies with negative findings are less likely to be published in any form and thus may be more difficult to locate.44 Among the studies that we did identify, relatively few had adequately adjusted for important predictors of disease-free and overall survival, such as age and histological grade,45 and this is a possible explanation for some of the positive findings. Overall we found little evidence that coping styles play an important part in survival from cancer. This is an important finding because there is often pressure on patients with cancer to engage in “positive thinking,” and this may add to their psychological burden. 46 47 It has been suggested that clinicians need to detect coping styles such as helplessness or hopelessness and treat them vigorously.7 Our findings show that such interventions may be inappropriate, at least when they are used with the aim of increasing survival or reducing the risk of recurrence. Good evidence in this subject is still scarce as there have been few large methodologically sound studies. Although the relation is biologically plausible, there is at present little scientific basis for the popular lay and clinical belief that psychological coping styles have an important influence on overall or event-free survival in patients with cancer. We are grateful to those who supplied additional data, Herman Faller, Allan House, and Sue Lockwood who commented on earlier versions of the paper, and Susan Kennedy for help with redrafting. We carried out a supplementary search in June 2002 to update the review while it was undergoing peer review: Medline 117 additional hits; PsycLit 88 additional hits; Assia 23 additional hits; Embase 113 additional hits; Cancerlit 115 additional hits; Dissertation Abstracts 88 additional hits; Healthstar no longer existed but is now part of NLM gateway and this was searched instead, 220 additional hits from Oct 2001-June 2002; CINAHL 60 additional hits from Aug 2001 to June 2002. None of these abstracts was relevant to the review and none met the inclusion criteria. Contributors: MP initiated the review and carried out the statistical analyses. MP, RB, and DH all contributed to the study protocol, screened abstracts, extracted data, and assessed the included studies. All authors contributed to interpreting the evidence and to writing the final paper. MP will act as guarantor. Funding MP is funded by the Chief Scientist Office of the Scottish Executive Department of Health and is a member of the ESRC-funded Evidence Network.
. Use of coping strategies and breast cancer survival: results from the Black/White cancer survival study. Am J Epidemiol 2000; 152: 940–949.
. Psychological response to breast cancer: effect on outcome. Lancet 1979; ii: 785–787.
. Coping and cancer prognosis. J Psychosom Res 1984; 28: 363–364.
. Mental attitudes to cancer: an additional prognostic factor. Lancet 1985; i: 750.
. Psychological response to breast cancer and 15-year outcome. Lancet 1990; 335: 49–50.
. Psychological response to cancer diagnosis and disease outcome in patients with breast cancer and lymphoma. Psychooncology 1992; 1: 105–114.
. Influence of psychological response on survival in breast cancer: a population-based cohort study. Lancet 1999; 354: 1331–1336.
. Psychosocial predictors of outcome: time to relapse and survival in patients with early stage melanoma. Br J Cancer 2000; 83: 1448–1453.
. Life events, coping and breast cancer: state of the art. Biomed Pharmacother 2000; 54: 229–233.
. Disease as a reflection of the psyche. N Engl J Med 1985; 312: 1570–1572.
. Meta-analysis of observational studies in epidemiology: a proposal for reporting. JAMA 2000; 283: 2008–2012.
. Undertaking systematic reviews of research on effectiveness: CRD guidelines for those carrying out or commissioning reviews. York: University of York, 1996.
. Psychosocial factors predictive of survival after allogenic bone marrow transplantation for leukemia. Psychosom Med 1994; 56: 432–439.
. Psychosocial factors and lung cancer prognosis. Psychooncology 1994; 3: 141.
. Do psychological factors predict survival in breast cancer? J Psychosom Res 1989; 33: 561–569.
. Psychosocial factors and breast cancer: a 6-year Italian follow-up study. Psychother Psychosom 1997; 66: 229–236.
. Psychosocial morbidity and survival in adult bone marrow transplant recipients—a follow-up study. Bone Marrow Transplant 1996; 18: 199–201.
. Psychological reactions in newly diagnosed gastrointestinal cancer patients. Acta Oncol 1997; 36: 803–810.
. Reactions to gastrointestinal cancer—variation in mental adjustment and emotional well-being over time in patients with different prognoses. Psychooncology 1998; 7: 413–423.
. Associations between coping and survival time of adult leukemia patients receiving allogenic bone marrow transplantation. Results of a prospective study. J Psychosom Res 2001; 50: 277–285.
. Psychosocial correlates of cancer survival: a subsequent report 3 to 8 years after cancer diagnosis. J Clin Oncol 1988; 6: 1753–1759.
. Psychosocial correlates of survival in advanced malignant disease? N Engl J Med 1985; 312: 1551–1555.
. Symptom distress, coping style and biological variables as predictors of survival after bone marrow transplantation. J Psychosom Res 1997; 42: 275–285.
. Prognostic factors and survival in a heterogeneous sample of cancer patients. Br J Cancer 1996; 73: 1594–1599.
. Correlates of hopelessness in cancer patients. J Psychosoc Oncol 1995; 13: 47–66.
. Psychobiological factors predicting the course of breast cancer. J Pers 1987; 55: 317–342.
. Psychosocial predictors of survival in metastatic melanoma. J Clin Oncol 1999; 17: 2256–2263.
. Psychosocial predictors of survival: metastatic breast cancer. Ann Oncol 2000; 11: 469–474.
. Psychosocial status at initiation of cancer treatment and survival. J Psychosom Res 1990; 34: 189–201.
. 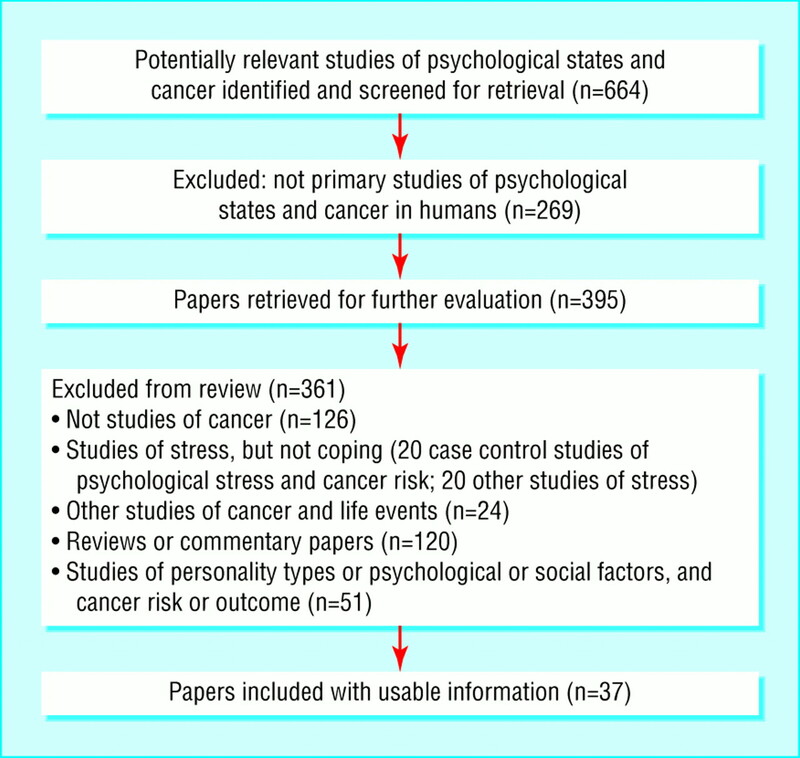 Psychological factors and prognosis in cancer. Psych Fenn 1979:19–24.
. Mood and clinical status in patients with multiple myeloma. J Clin Oncol 1991; 9: 2219–2224.
. Predictors of cancer progression in young adult men and women: avoidance, intrusive thoughts, and psychological symptoms. Health Psychol 1994; 13: 539–547.
. Psychological factors in the prognosis of malignant melanoma: a prospective study. Psychosom Med 1979; 41: 647–655.
. The significance of psychosocial factors for the course of breast cancer—results of a prospective follow-up study. Schweiz Arch Neurol Psychiatr 1990; 141: 429–455.
. Coping strategies and course of disease of breast cancer patients. Results of a 3-year longitudinal study. Psychother Psychosom 1991; 55: 151–157.
. Are coping strategies related to disease outcome in early breast cancer? J Psychosom Res 1996; 40: 255–264.
. Coping strategies and 10-year outcome in early breast cancer. J Psychosom Res 1997; 43: 625–626.
. Psychological coping mechanisms and survival time in metastatic breast cancer. JAMA 1979; 242: 1504–1508.
. Coping, distress, and survival among patients with lung cancer. Arch Gen Psychiatry 1999; 56: 756–762.
. Beeinflussen psychologische Faktoren die Uberlebenszeit bei Krebskranken? II: Ergebnisse einer empirischen Untersuchung mit Bronchialkarzinomkranken. [Do psychological factors modify survival of cancer patients? II: Results of an empirical study with bronchial carcinoma patients]. Psychother Psychosom Med Psychol 1997; 47: 206–218.
. The prognostic significance of psychosocial factors in women with breast cancer. J Chron Dis 1987; 40: 729–735.
. Can psychotherapy increase the survival time of cancer patients? J Psychosom Res 2000; 49: 149–156.
. Statistical methods in epidemiology. New York: Oxford University Press, 1989.
. Publication bias and the integrity of psychiatry research. Psychol Med 2000; 30: 253–258.
. Breast cancer. BMJ 2000; 321: 745–750.
. Thinking differently about thinking positive: a discursive approach to cancer patients' talk. Soc Sci Med 2000; 50: 797–811.
. Positive thinking and moral oppression in cancer care. Eur J Cancer Care 1997; 6: 249–256.
. Development of a questionnaire measure of adjustment to cancer: the MAC scale. Psychol Med 1988; 18: 203–209.
. Psychosocial and physical correlates of survival and recurrence in patients with head and neck carcinoma: results of a 6-year longitudinal study. Cancer 1998; 83: 2567–2579.
. Rehabilitation outcomes of long-term survivors treated for head and neck cancer. Head Neck 1995; 17: 503–515.
. Psychological and social adjustment to mastectomy. Cancer 1977; 40: 2381–2387.
. Psychometric assessment of the Jalowiec coping scale. Nurs Res 1984; 33: 157–161.
. Health and daily living form manual. Palo Alto, CA: Social Ecology Laboratory, Stanford University Medical Center, 1983.
. The measurement of pessimism: the hopelessness scale. J Consult Clin Psychol 1974; 42: 861–865.
. Pessimism, age, and cancer mortality. Psychol Aging 1996; 11: 304–309.
. Reliabilitat und Validitat des Zurcher Fragebogens zur Krankheitsverarbeitung (ZKV-R) [Reliability and validity of the Zurich questionnaire of coping with illness]. Schweiz Archiv Neurol Psychiatr 1991; 142: 553–567.
. Freiburger Fragebogen zur Krankheitsverarbeitung. Weinheim, Germany: Beltz, 1989.
. Impact of event scale: a measure of subjective stress. Psychosom Med 1979; 41: 209–218.
. The pathway between subjects' recent life changes and their near-future illness reports: representative results and methodological issues. In: Dohrenwend B, Dohrenwend B, eds. Stressful life events: their nature and effects. New York: John Wiley, 1974.